1 2 3 Bowman, Mark (April 23, 2008). "Smoltz enters exclusive 3,000 K-Zone". MLB.com. Retrieved January 18, 2010. 1 2 "Steve Carlton Statistics and History". Baseball-Reference.com. Archived from the original on 4 January 2010. Retrieved January 18, 2010. 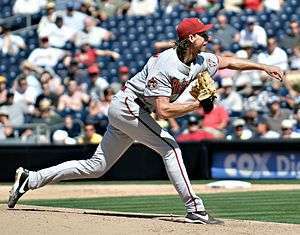 1 2 "Randy Johnson Statistics and History". Baseball-Reference.com. Retrieved January 18, 2010. ↑ Luft, Jacob (September 20, 2000). "3k the fast way: Big Unit is quickest to 3,000 strikeouts". Sports Illustrated. Retrieved January 18, 2010. 1 2 3 4 5 6 7 8 9 10 11 12 13 14 15 16 17 18 19 20 21 22 23 "Johnson joins 3K club in Arizona's loss to Florida". Sports Illustrated. Associated Press. Retrieved January 18, 2010. ↑ "Career Leaders & Records for Wins". Baseball-Reference.com. Retrieved January 18, 2010. ↑ "The All-Century Team". MLB.com. Archived from the original on 19 January 2010. Retrieved January 18, 2010. ↑ "All-Century Team final voting". ESPN. October 23, 1999. Retrieved January 20, 2010. 1 2 3 Noble, Marty (September 3, 2007). "Pedro records 3,000th strikeout". MLB.com. Retrieved January 18, 2010. ↑ Mitchell, Fred (July 20, 2005). "Maddux on the verge of 3,000 strikeouts". Chicago Tribune. ↑ "Hall of Fame Class of 2015" (Press release). National Baseball Hall of Fame and Museum. January 6, 2015. Retrieved January 6, 2015. ↑ "2013 Hall of Fame Vote a Shutout" (Press release). National Baseball Hall of Fame and Museum. January 9, 2013. Retrieved January 9, 2013. ↑ Kurkjian, Tim (January 9, 2012). "Whopper of a list of names await in 2013". ESPN.com. Retrieved May 21, 2012. But Clemens is, after [Barry] Bonds, the next face of the steroid era. He has been charged with lying before Congress about his use of performance-enhancing drugs. He has no chance to make it to Cooperstown next year, or for many, many years to come. ↑ Caple, Jim (December 22, 2010). "The Hall of Fame ballot runneth over". ESPN.com. Page 2. Retrieved July 21, 2013. ↑ Caple, Jim (January 4, 2012). "Too many good Hall candidates for limit". Page 2. ESPN. Retrieved July 21, 2013. ↑ "Rules for Election". National Baseball Hall of Fame. Archived from the original on 30 May 2010. Retrieved June 21, 2010. ↑ "Nolan Ryan Statistics and History". Baseball-Reference.com. Archived from the original on 4 January 2010. Retrieved January 18, 2010. ↑ "Roger Clemens Statistics and History". Baseball-Reference.com. Archived from the original on 4 January 2010. Retrieved January 18, 2010. ↑ "Bert Blyleven Statistics and History". Baseball-Reference.com. Retrieved January 18, 2010. ↑ "Tom Seaver Statistics and History". Baseball-Reference.com. Archived from the original on 4 January 2010. Retrieved January 18, 2010. ↑ "Don Sutton Statistics and History". Baseball-Reference.com. Retrieved January 18, 2010. ↑ "Gaylord Perry Statistics and History". Baseball-Reference.com. Archived from the original on 12 February 2010. Retrieved January 18, 2010. ↑ "Walter Johnson Statistics and History". Baseball-Reference.com. Retrieved January 18, 2010. 1 2 Muskat, Carrie (July 26, 2005). "Giant milestone: Maddux fans No. 3,000". MLB.com. Retrieved January 18, 2010. ↑ "Greg Maddux Statistics and History". Baseball-Reference.com. Retrieved January 18, 2010. ↑ "Phil Niekro Statistics and History". Baseball-Reference.com. Retrieved January 18, 2010. ↑ "Fergie Jenkins Statistics and History". Baseball-Reference.com. Retrieved January 18, 2010. ↑ "Pedro Martínez Statistics and History". Baseball-Reference.com. Archived from the original on 4 January 2010. Retrieved January 18, 2010. ↑ "Bob Gibson Statistics and History". Baseball-Reference.com. Archived from the original on 4 January 2010. Retrieved January 18, 2010. 1 2 "Schilling reaches 3,000 career strikeouts". ESPN Internet Ventures. Associated Press. August 31, 2006. Retrieved January 18, 2010. ↑ "Curt Schilling Statistics and History". Baseball-Reference.com. Retrieved January 18, 2010. ↑ "John Smoltz Statistics and History". Baseball-Reference.com. Archived from the original on 4 January 2010. Retrieved January 18, 2010.